“The Impact of Charter Schools & School Closings on Public Education and What We Can Do About It” was the headline on this important forum held in Bed-Stuy Brooklyn in the heart of charter school territory. Michael Fiorillo from ICE and GEM opened up with a powerful historical perspective that had people on the edge of their seats. Here is part 1. Make sure to see part 2 for the complete picture. See the ad and flyer sent out to schools below. Do you care about the future of public education? Do you have questions or concerns about the role charter schools are playing in our educational system? Did you know that 50 charter schools are currently housed in public school buildings? Did you know that many of the public schools the DoE and Bloomberg plan to close, could be replaced by charter schools? 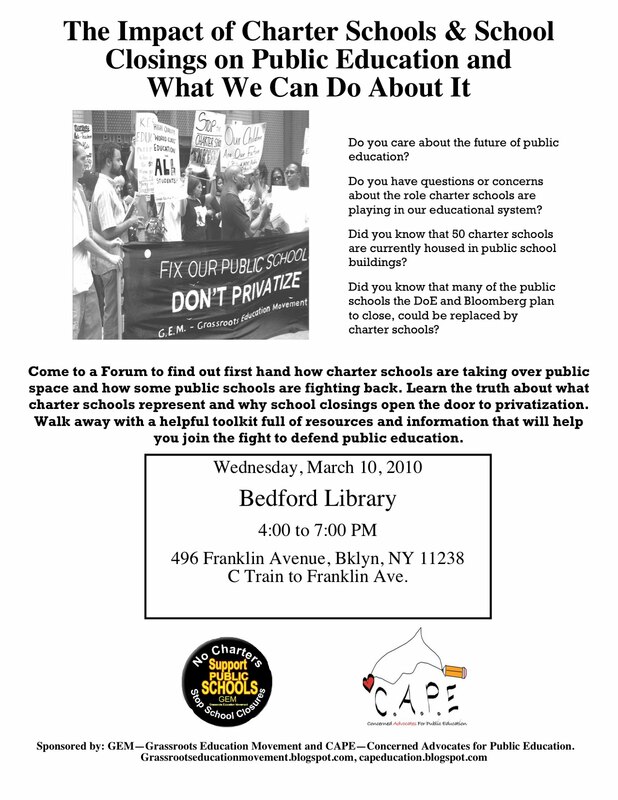 Come to a Forum to find out first hand how charter schools are taking over public space and how some public schools are fighting back. Learn the truth about what charter schools represent and why school closings open the door to privatization. Walk away with a helpful toolkit full of resources and information that will help you join the fight to defend public education. GEM—Grassroots Education Movement and CAPE—Concerned Advocates for Public Education. « Quality & Equal Public Education – No to Privatized Charter Schools!